Thanks to the incredible work of our membership, the design awards are back in action at AIA Bucks! We had twice as many applicants this year as we had in the previous two years, which enabled us to offer three awards - a Silver and two Honor awards. You can see more information about the jury and award winners on the Awards page. As usual, the Logan Inn did not disappoint! Tucked away in the rear dining room we had a warming fire and a vast array of hors d'oeuvres to keep us comfy and cozy during some cheerful pre-holiday mingling. Our jurors shared their comments for each project as they announced the winners and presented the project team with their certificates. To culminate the evening, the slate of officers for the new calendar year was presented to and approved by those in attendance. The 2015 Executive Committee can be viewed here. Our excitement for welcoming new officers to the board is tempered by the departure of others whose contributions have been immeasurable over the years. Most notably were E. Jane Wilson, who was presented with some parting gifts in anticipation of her migration to Canada in 2015; as well as Gary O'Connor for his years of service on the Executive Committee, most recently as 2014 President. In conclusion, the Holiday Gathering was a great success and for some the night's merriment continued well after the "closing ceremonies!" AIA PA hosted its inaugural Celebration of Architectural Excellence Awards Gala at the BARNES Foundation in Philadelphia. From 6:00pm to about 9:30, the night's festivities included drinks, hors d'oeuvres, live music, architectural tours of the new museum, strolls through the galleries, awards and of course plenty of mingling! It was a spectacular night of art, architecture, and cutting loose! Many thanks to the hard workers at AIA PA for putting on such an elegant affair, including our own state director, Jane Wilson. And congratulations to the award recipients, among them some from our chapter including President-elect Jo Hohenwarter for the Emerging Professionals Award. 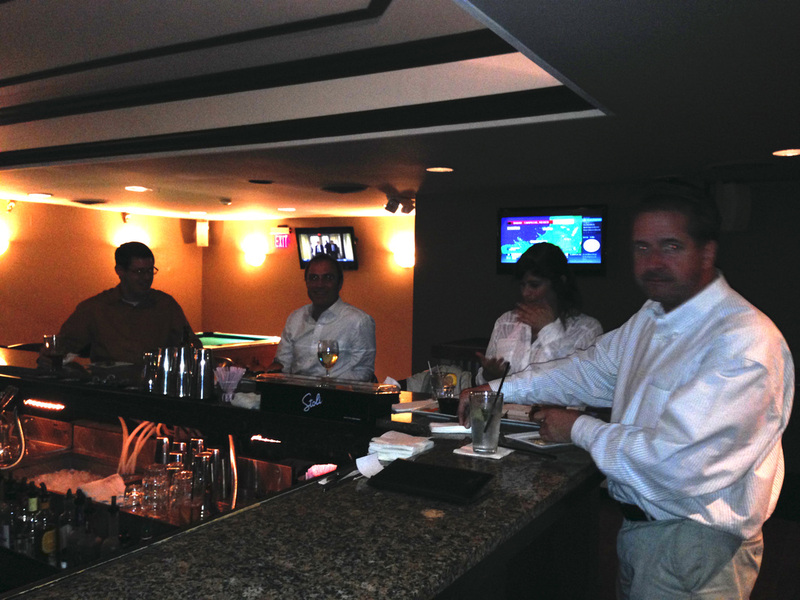 The chapter hosted a mixer for current and prospective members at the Ramada in New Hope - more specifically, the restaurant inside the Ramada known as the Rrazz Room. With a round of appetizers sponsored by the chapter and happy hour specials, most attendees had plenty of fuel to keep their fraternizing spirits up! Two non-members joined in the fun and were hopefully convinced of the merits of membership! The chapter's September meeting began with a social hour at the Logan Inn in New Hope including hors d'oeuvres sponsored by the evening's presenters. After some light fare and fraternization, attendees gathered round the presentation screen to hear tales of the latest technologies in the residential kitchen cabinetry scene, as told by Dan Morabito. 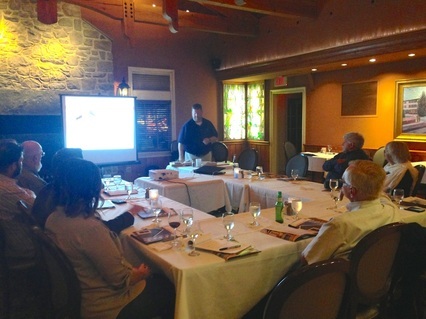 The second CEU of the evening reviewed the exterior trim and siding products residential designers are familiar with, as well as some new products relatively fresh to the market (i.e. fly-ash trim!). Although the presentations concluded around 8:30, for some the night continued with another social hour (or two... or three!). 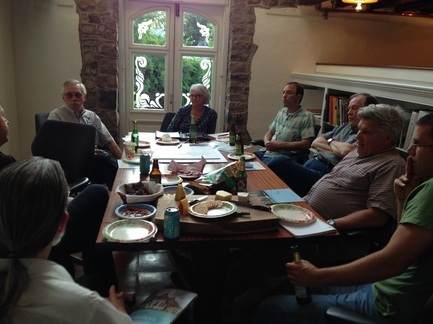 The Bucks County AIA hosted its first (of hopefully many!) Tech Night. Architects and builders gathered around the conference table and shared experiences and general practices pertaining to super insulated walls. With articles from the Journal of Light Construction for inspiration, and a large sketch pad for articulating details, the conversations carried on well into the evening! ﻿The Bucks County AIA's newly formed Outreach Committee had its first outreach event this month at E.M. Crouthamel Elementary School in the Souderton Area School District. Committee members Jane Wilson, Kristin Holmes and Jo Hohenwarter began each class with a brief introduction to the world of architecture and engineering by sharing examples of their work including working drawings, 3D models and personal sketchbooks. To keep the presentation relevant to the 5th graders, Kristin and Jo shared some of the work they had prepared with the Save Kids Castle (SKC) Committee, as well as a progress video prepared by SKC. Next came the fun part! The students were challenged to follow their own creative instincts by assembling structures from toothpicks and modeling clay, provided by teacher Mary Mangum. With just 15 minutes for this nano-scale "design/build" project, the resulting structures were as diversely inspired as they were creatively constructed! Students found inspiration in everything from outer space to carnival rides to their own experiences with Kids Castle. The class concluded with each student presenting his/her project and discussing what difficulties, ideas or ambitions he/she had while working with the materials. Jane was impressed by the students' approaches to the design, "as in architecture school, they were asked to present their structure to the class - I was impressed that so many of them were able to articulate what they did and why." Jo was excited by the array of designs the students created, "I was worried we might see a lot of pyramids or basic forms, but I was vastly underestimating this creative bunch." Kristin appreciated the way students worked together, “it was nice to see some students work together in pairs to help each other and give each other feedback on what they were building." The Outreach Committee wishes to extend its gratitude to hosting art teacher, Mrs. Mangum and Principal Mrs. Callahan. If you would like to be a part of AIA events like this, please contact AIA Bucks County and join the committee!